There’s always going to be a document which discusses the terms that certain parties will agree on when they are required to do business together. For example, one has to make a reseller agreement in the event that one entity is allowing another entity to resell whatever products have been provided. Another would be having the need to create a rental agreement to settle matters between a landlord and tenant regarding how the tenancy will go. 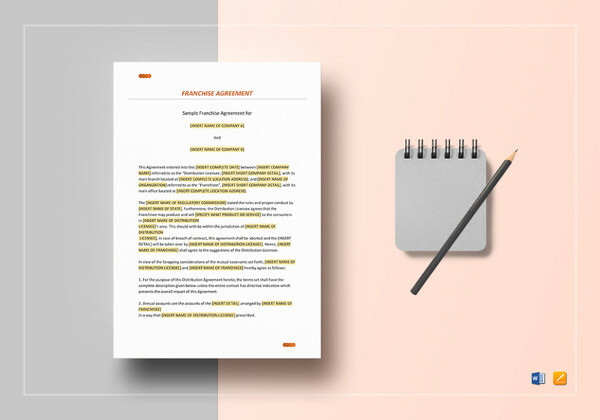 So if you wish to define the terms on how other businesses were to use your brand, then you will need to come up with a franchise agreement and this article will teach you how to do just that. 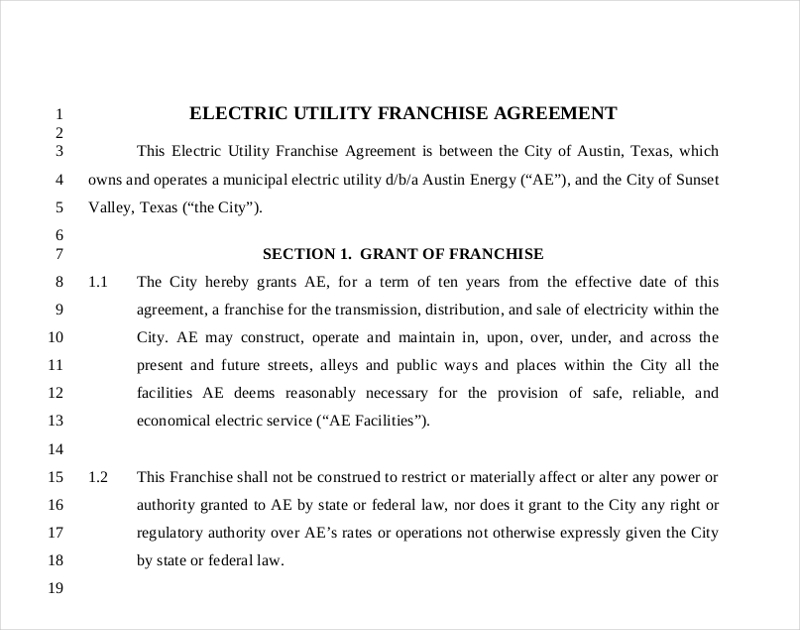 Much like a service level agreement, a franchise agreement will require necessary information in order for one to learn the different the terms that need to be agreed upon before any kind of business can take place. This means that you’ll need to know just what kind of information you should put in so that the document will be valid. If you were to make something like a payment agreement, then you would want to know tho the payer and the receiver is right? It’s pretty much the same situation in a franchise agreement where it needs to be able to identify the roles of the parties that are involved. 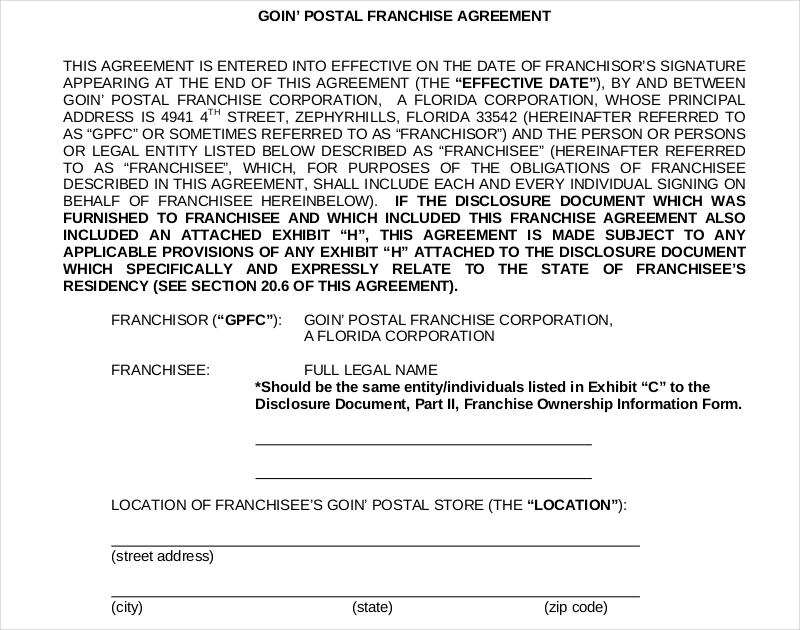 Typically you’re drafting a franchise agreement with the idea of having several different franchisees, so you may want to provide blanks for the name and location of the franchise when you come up with the final document.Typically, you can use the label “Franchisor” for yourself and “Franchisee” for the person that’s going to be purchasing the franchising rights from you. In something like a Loan Agreement, there’s a section which discusses the terms in which the borrower will need to agree to in order to acquire a loan. 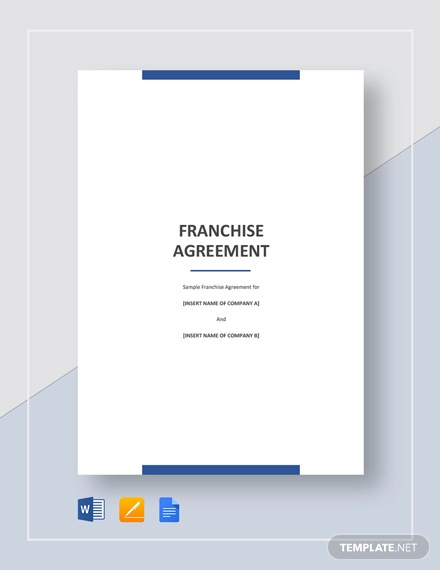 A franchise agreement will also need a similar section to ensure that the other party has a complete understanding of what needs to be agreed to if he or she wishes to be a part of the franchise. 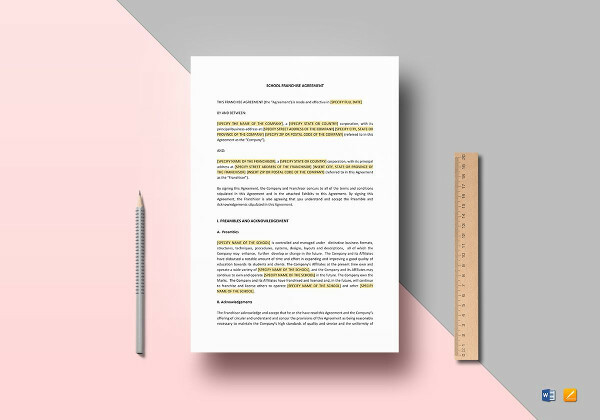 In a tenancy agreement, there’s a statement which tells the applicant that he or she will be granted the rights to the property if he or she were to agree to the terms. 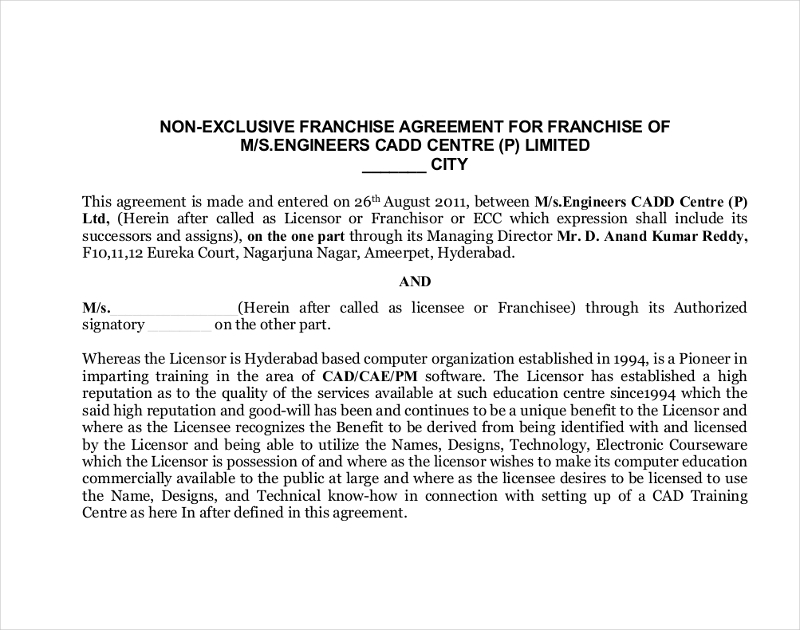 The franchise agreement also has this sectionsection specifies the right and license you are granting to the franchisee. 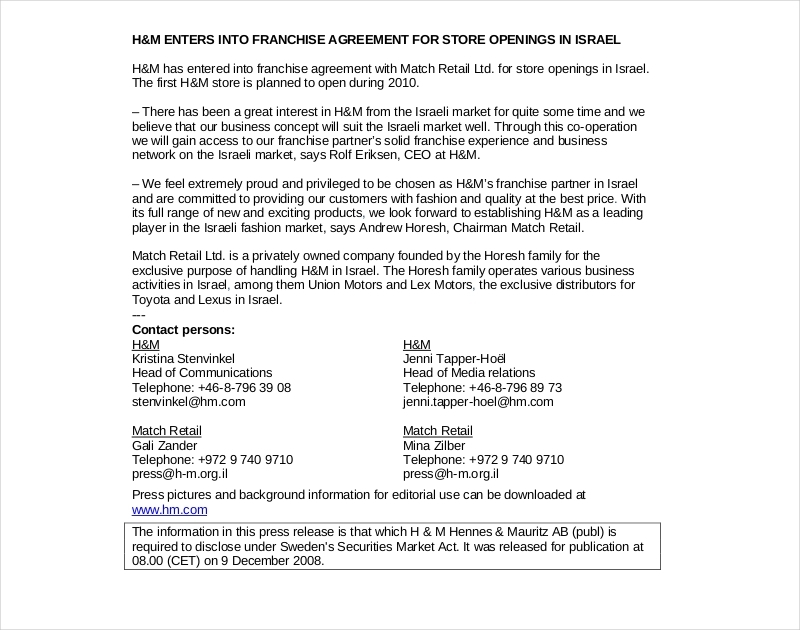 Not only that, but it will also discuss the limits as to what the franchisee may be able to do with the license and listing any rights that are reserved and identifying the license as nonexclusive in nature. 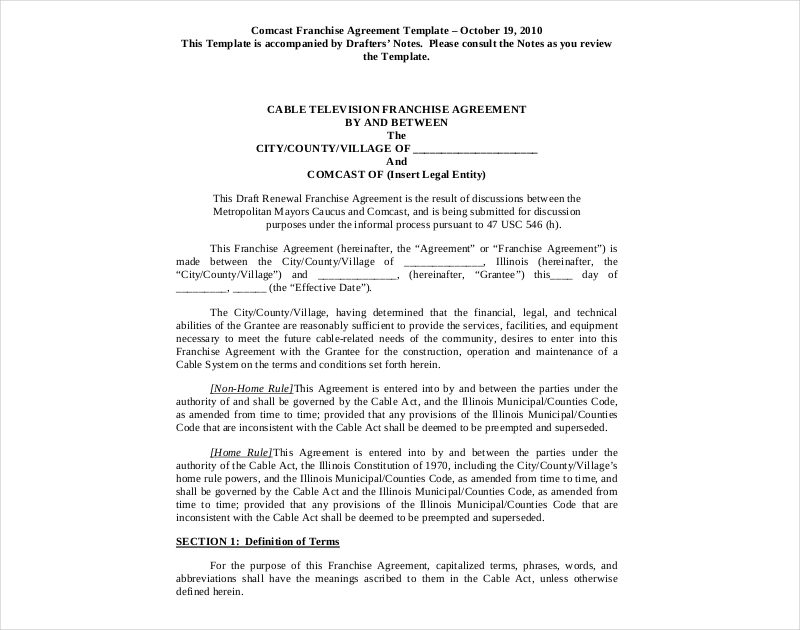 Much like an attorney agreement, this document should have a section which discusses the duration of the agreement. 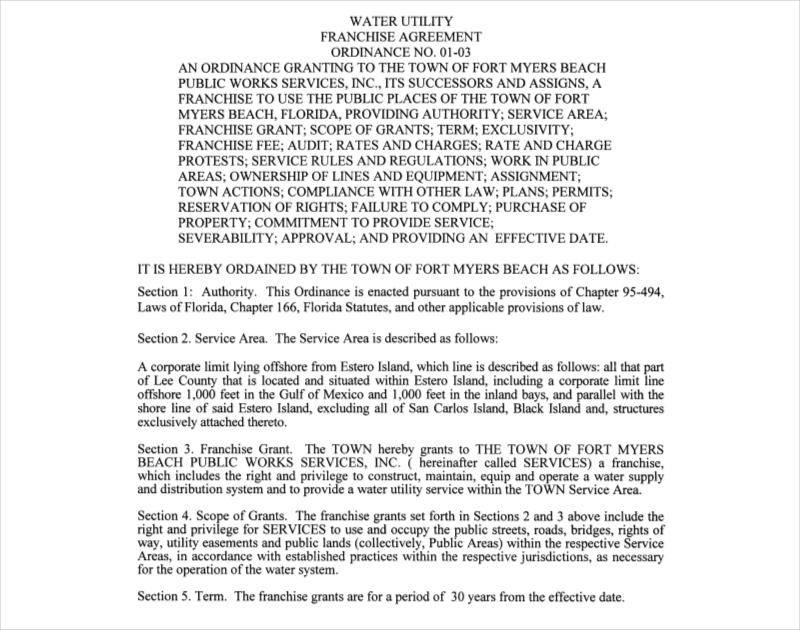 You must set an initial term for the agreement and provide the procedures for renewing it. While you can always have the option of putting in an automatic renewal, you also may want to provide conditions in which the other party will have to meet with in order to renew his or her part with the franchise. If you want to protect your brand, then you have to ensure that the franchisee has an establishment that will best represent it. This is the reason as to why you’ll need to set up the required conditions that the franchisee will have to meet in regards to the cleanliness of the facility, how the operations are going to be managed, the kind of equipment that has to be used and much more. 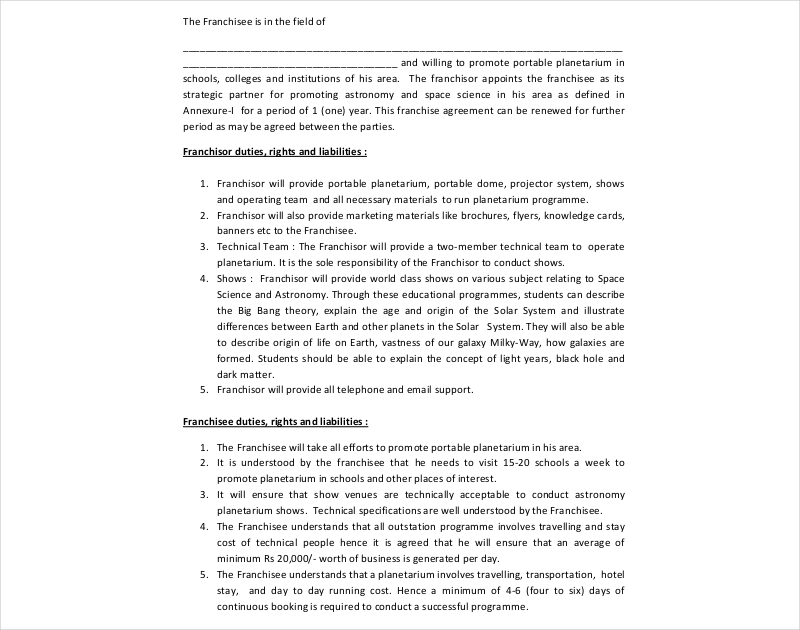 This way, one can ensure that the facility meets with the standards that have been set in order to continuously attract customers.You may also see simple agreement letter examples. In the event that you would like to learn about other types of agreements (commission agreement, subordination agreement, etc. ), then all you have to do is go through our site. We have all the articles which contain the information which should be able to help you with whatever is it that you need.